For the first time, Leonard brings our many environmental and social issues under one umbrella—our problem with consumption. Brilliantly combining information about the economy, cultures, and the environment, Leonard describes the five stages of the materials economy—extraction, production, distribution, consumption, and disposal. She illuminates how our “growth at all costs” economy operates, visiting dumps and factories around the world, she reveals the real story behind our possessions—why it’s cheaper to replace than to fix a broken flat screen TV, how the economic theory of “perceived obsolescence” encourages companies to bring out new versions of computers and cell phones ever more rapidly, to making us feel that we need the updated version. Leonard uncovers and communicates a new idea—that there is a deliberate system based on specific economic theories behind our patterns of consumption and disposal. 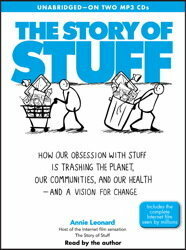 The Story of Stuff transforms how we think about our lives and our relationship to the planet, and offers hope that change is within reach. This is an INCREDIBLY anti-American, anti-capitalism book financed by groups that are equally anti-American and working toward socialism. The message is, "The government is here to take care of us." It even spends time criticizing George Bush for telling people to "shop" after 9/11, not being accurate: Yes, he said to continue life as normal, keep the economy going for ALL our good. Did he first say PRAY? YES! However, liberals are not fans of God, as a whole. This book isn't worth a read or a listen. I wouldn't even use the pages as toilet paper in an outhouse.